By Bob Schmatt and Wiley Carroll. Gives great bobcat trapping information with many illustrations. 85 pgs. Bobcat techniques and locations in detail. Bobcat equipment, general location, specific location, bobcat sets, flagging and squeakers, records and other important tips. Also includes Grey Fox Trapping refresher. Thousands Sold! 68 pages. Illustrated. By Larry (Slim) Pedersen. Over forty-five years of bobcat trapping experience from North to South and from East to West, with catches of over 200 bobcats, is behind the reliable and priceless information found in this book. Includes correct set construction, where, when, why, and how. Plus time and effort saving tricks. 66 pages, 100+ pictures. This is an excellent book for experience in bobcat trapping. This book is jam packed with ideas and different sets to be used to increase your catch on the trapline. This book will certainly increase your skills and techniques. This is a real cheap investment to obtain the knowledge this book can give you. By Tom Krause. This is the book of excellence for experience trappers who want to push their skills even further! 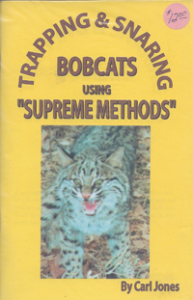 The information on bobcat trapping may be the most efficient methodology in print, and this book contains advanced thought processes used by high-speed, high production trappers. A cheap investment for all serious trappers. Dynamite Predator Trapping will change the way you trap predators and change the way you think. 80 pages. 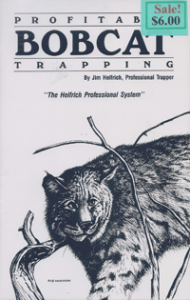 Here is the most comprehensive book on trapping bobcats on the market. Written in the Milligan style of plain talk, this book takes you from the workshop to the field, to the fur shed. Everything you need to know to take bobcats in North America. 63 pages. By Jim Helfrich. 23 pages. By Carl Jones. Covers trap size and modification, the proper size and use of snares, picking locations, the use of sound and sight attractors, favorite sets, proper lure usage, how to keep a trap operating in foul weather, and proper fur handling techniques.